Once upon a time the world was young, hot and violent. It took about a billion years from its birth 4570my (my = million years) ago for things to quieten down. 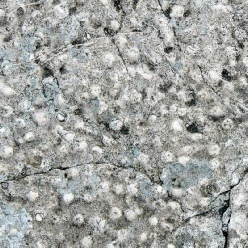 By then, the surface had cooled enough for a rock crust to form on it, and volcanoes had started to create small continents from rocks such as quick-cooled basalt on the surface and slow-cooled granite beneath. 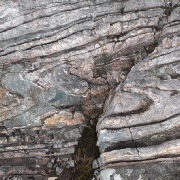 These mini-continents (terranes) were lighter than the rest of the crust, since the heavier minerals tended to sink out of the granite when it was still molten. 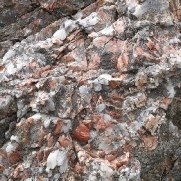 Often the granite was forced deeper underground by collisions between terranes and was altered (metamorphosed) by the temperature and pressure there into gneiss (nice), a rock type in which the minerals are often sorted into striped layers (foliation). 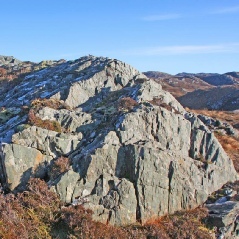 In the region which would one day become North West Scotland, a group of these terranes formed, with basements of gneiss (called Lewisian Gneiss here); the original granite-type rocks in these had been formed 3100-2800my ago, and they were turned to gneiss at about 2700my, perhaps 40km underground. 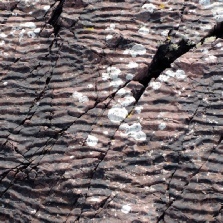 At 2400-2200my much of the gneiss cracked apart as the land stretched, and the cracks were filled by molten rock from below: these can still be seen as stripes across the gneiss, and are called Scourie Dykes. 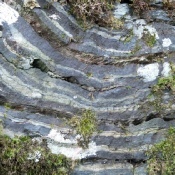 Then, 1670my ago, our group of terranes finally joined together properly to make a larger terrane (“Hebridean”); the collision had many effects (two are shown here) which we can still see today, resulting in a remarkably varied rock. Meanwhile, in the Gairloch area a remarkable set of different rocks had been added to our particular terrane, about 2000my ago: the Loch Maree Group. These had been formed on an ocean floor and pulled under the gneiss by the process called subduction. 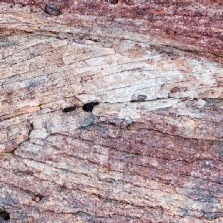 They were then folded into the gneiss and metamorphosed during the 1670my episode. 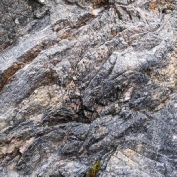 They include amphibolite (formerly ocean-floor basalt) which makes rocky hills, semipelite (formerly ocean-floor sediment, greywacke, a muddy sandstone), colourful sulphide mineral deposits (from undersea hot springs known as black smokers), low-quality marble (formerly a very early limestone), banded iron formation (BIF, the only example in Britain), and others. By now the process called plate tectonics was well under way. The earth's surface is made of plates, oceanic (made of basalt) and continental (made of many rocks), which move constantly. Oceanic plates are being constantly created along volcanic ridges, and destroyed by being dragged down into the depths of the earth (subduction). But the lighter continental plates, like floating islands or icebergs, are safer; they may join and divide, but they are not destroyed because they are buoyant and often have a strong basement of gneiss. When continents collide, mountain ranges are pushed up; it may take as little as 50 million years for these ranges to be eroded back down to nothing, and their remains then form layers of new rock (sedimentary). In our area, the rocks above the gneiss were worn down until the gneiss lay on the surface, ready for the next stage. To the west a mountain range formed, which was then eroded to create a huge amount of sediment. 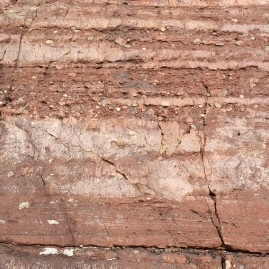 This sediment was carried by broad rivers to be deposited on the Gneiss. 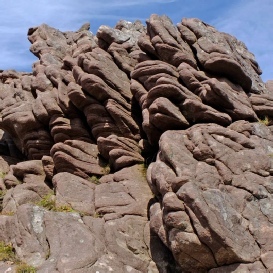 Under its own weight it was compressed to form 2km-thick sandstone, the first Torridonian Sandstone: the Stoer Group of formations, 1200my ago. Something interesting happened in the middle of this process: a large meteorite landed, probably near Lairg, creating a blast of pulverised and molten rock which makes one of the sandstone layers look very different. This is the now famous Stac Fada rock. 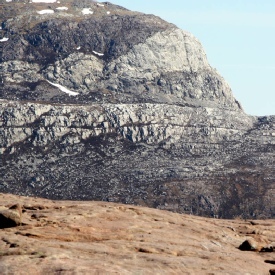 At 1000-950my, another mountain range was eroded and the much bigger Torridon Group sandstone was laid down, at least 5km thick, on top of the Stoer Group or the gneiss; this includes the Applecross Formation, the material which most of our hills are made from. 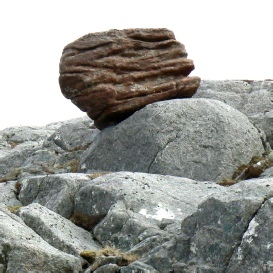 Torridonian Sandstone often shows signs of its origin in rivers and shallow lakes, in a hot dry environment near the equator. 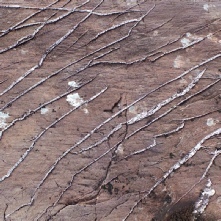 You can see ripples, drying cracks, layers of pebbles, cross-bedding, layers of sand of different colours and textures. 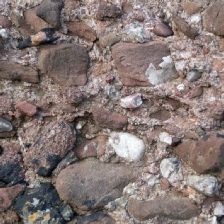 Most of the material comes from the west, but some includes stones of local rock like Gneiss or Amphibolite: ancient scree. 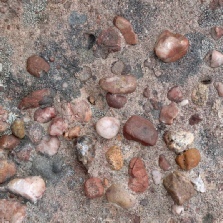 The reddish colour comes from feldspar, the most common mineral in the sandstone; the other main mineral is quartz, which also forms the cement which holds it all together, and is also often seen in thin veins. 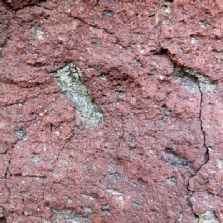 In the rock has been found the earliest evidence in the world of complex-celled life on land (eukaryotes). Amazingly, this sandstone has managed to survive a billion years without being metamorphosed (probably thanks to its solid gneiss foundation). It tends to split into blocks because of its layers (bedding) and vertical cracks (jointing); this helps to explain the terraced form of the hill slopes. By now we were on the eastern edge of a continent called Laurentia (today’s North America). As we drifted to the South Pole and back again, much of the sandstone was eroded off. 540my ago the next rock was deposited on top of it, along the shore of the Iapetus Ocean. 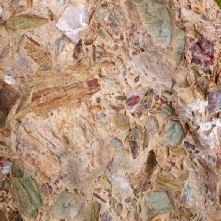 This was a white sandstone, formed from beach sand which was almost entirely quartz; it is called Cambrian Quartzite. Today it forms a grey-white cap on many of the hills. This was a period when life was taking off, and you can see evidence in the upper layers of this rock: numerous "pipes", the fossilised burrows of marine worm-like creatures. 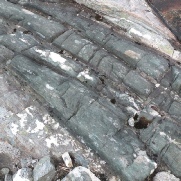 On top of the quartzite, still in the sea, other rocks were laid down in smaller quantities: Fucoid Beds, Salterella Grit and Durness Limestone, all containing fossils. Up to now, Scotland had not been assembled; it would be put together when five small chunks of eastern Laurentia came together. 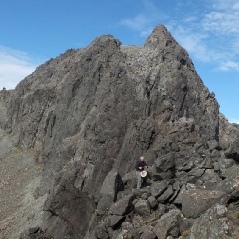 These five terranes all had very different geological stories to tell, making Scotland perhaps the most geologically varied country of its size in the world. 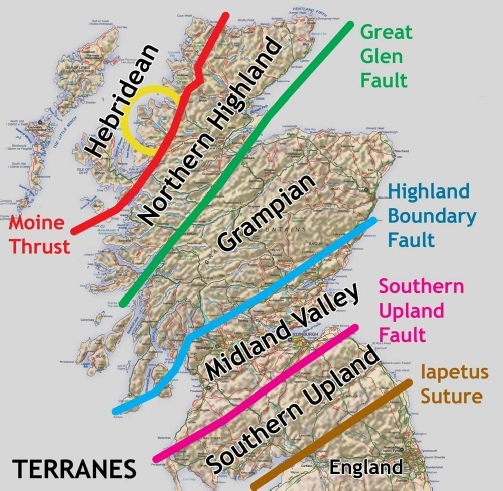 Our "Hebridean" terrane was by far the oldest. Meanwhile England belonged to a different continent, the smaller Avalonia. A third local continent was Baltica (now Scandinavia). Laurentia, Avalonia and Baltica had been joined to the supercontinent Gondwana at the South Pole, but they broke away from it and separated 580my years ago. The joining of the five parts of Scotland, and England, was caused by a series of collisions between these continents. 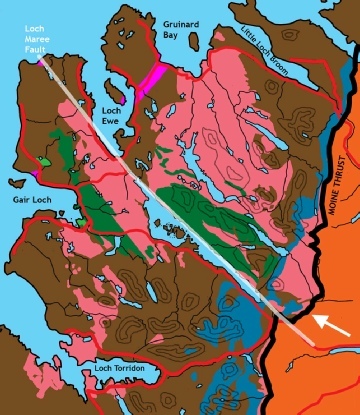 What concerns us is that 430my ago Baltica ploughed into us from the east, pushing up the Caledonian Mountains, and driving ahead of it for 50-100km a large area of a rock called Moine Schist. 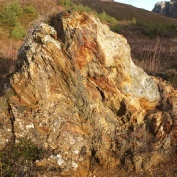 This rock had been formed on the sea-bed, possibly from the same material as the Torridonian Sandstone, and then metamorphosed. 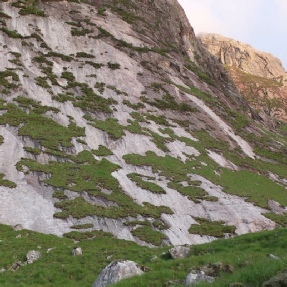 Beinn Eighe, Beinn Liath Mhor and Sgorr Ruadh are "imbricated", with alternate slices of sandstone and quartzite: as you walk along their ridges the rock keeps changing. 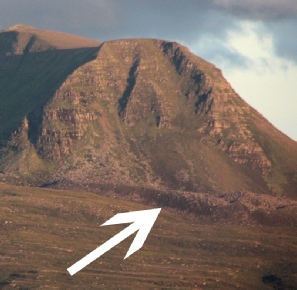 Meall a' Ghiuthais and Maol Chean-Dearg have older sandstone tops above younger quartzite: the sandstone was pushed over the quartzite. 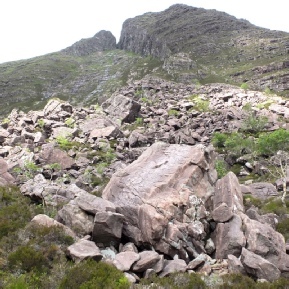 Beinn a' Mhuinidh (next to Slioch) has a gneiss summit above sandstone above quartzite, and a gneiss base! 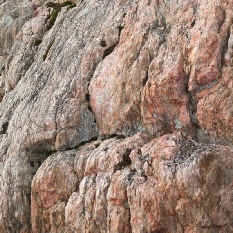 - a series of thrusts pushing slabs (nappes) of rock on top of each other. 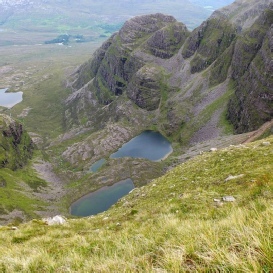 Mullach Coire mhic Fhearchair has an unexpected east ridge whose top is gneiss; the rock is very shattered thanks to its violent treatment. 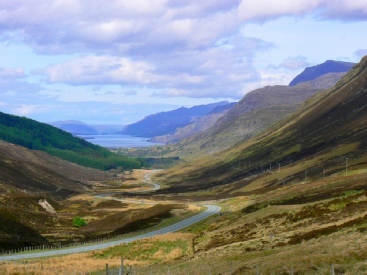 At the top of Glen Docherty, after the drive west from Achnasheen, there is a viewpoint. Many drivers stop there, because the view is startling: a different world lies ahead. 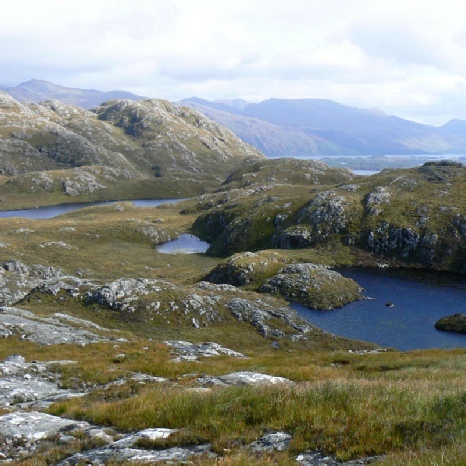 Wester Ross is a rugged, rocky, complex area formed by hard ancient rocks, contrasting with the greener, softer land to the east. 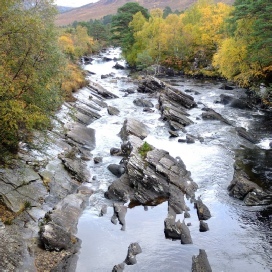 As you drive down Glen Docherty, you are crossing the Moine Thrust. There is a brief postscript to the story of our rocks. 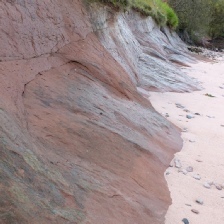 250my years ago, in a desert environment, Triassic (or New Red) Sand-stone was laid down; most of it is under what is now the sea, but there is a small strip of it from Aultbea to Laide. Next to it, under the sea, a little Jurassic Limestone was laid down next to the Triassic. At this stage our landscape had not been formed. 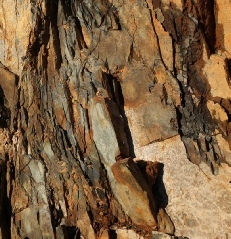 But over the next 200 million years weathering (rock damage) and erosion (rock removal) were at work. A new super-continent Pangaea had formed and now broke up: cracks appeared to the west of Scotland, at last separating it from Laurentia. 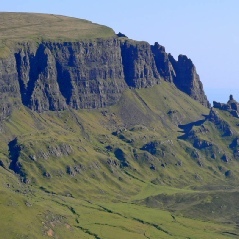 65my ago the Atlantic Ocean started to widen (because of a Hot Spot which is now under Iceland), and volcanoes formed down what is now the west coast (Skye, Mull, Ardnamurchan, etc); the main effect of all this activity for us was to raise Scotland above sea level and give it its shape. Now the final stages of creating our landscape could start. 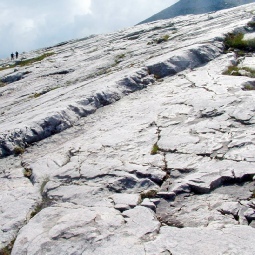 Valleys formed, often where cracks (faults) had weakened the rock. 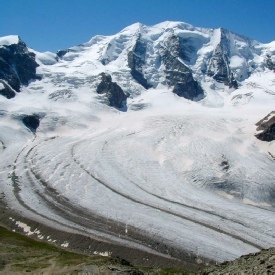 Eventually our northern drift took us into the realm of Ice Ages, and glaciers could start to carve the land, deepening the valleys and isolating the mountains. 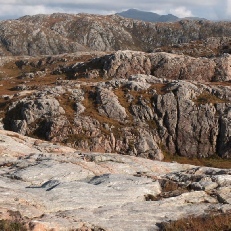 The final stages of the last Ice Age were the Wester Ross Readvance, about 16,000 years ago, and the Loch Lomond Readvance, ending 11,500 years ago; these put the finishing touches, cutting out corries, narrowing mountain ridges, laying down the sandy basis of soil, and scattering boulders and gravel over the land. The desert left by the ice was soon covered by vegetation. Humans arrived. And they all lived happily ever after (or at least until the next Ice Age, the next inundation, the next tectonic activity, or serious climate change). 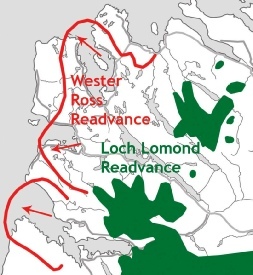 This is an attempt to summarise the geological past of Wester Ross in narrative form with minimal jargon; but it’s still not simple! For more detail and explanation, see my booklet “Wester Ross Rocks”. Simplified geological map of our area. 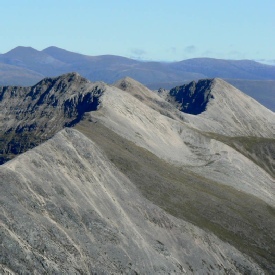 Meall a’ Ghiuthais: older sandstone above younger quartzite. Note the quartzite “bow-wave” as the sandstone was thrust from the left. whins and ferns and windblown rowan. in hundreds thousands millions billions. last and least the storm of upstart life ... and us. too taken with our niceties to notice it? Recognise the rock and make it glad.